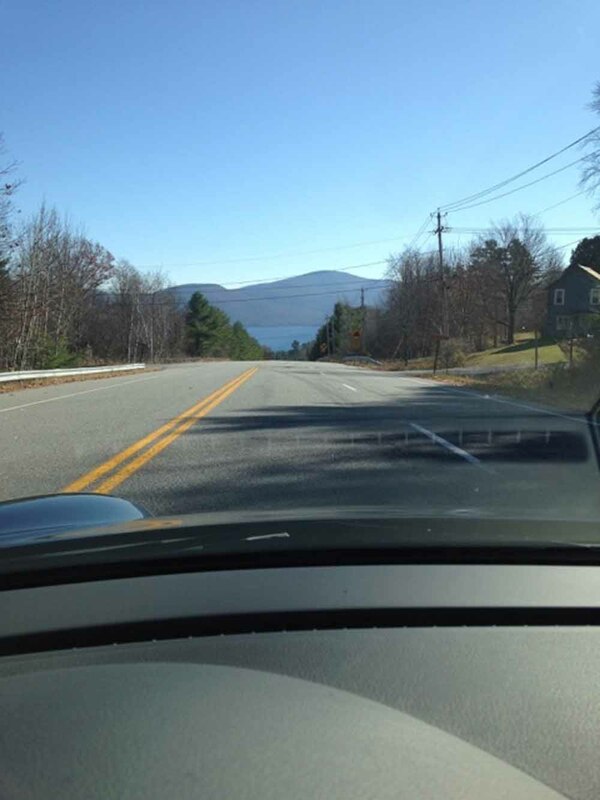 Firstly, let me say I recommend this drive in either spring before the camps open, or in the fall after camp closings and when the leaf peepers are done. One of the nice things about this loop is it starts right from exit 24 on 87 going north. When you exit turn right onto County highway 11 and almost immediately cross the Schroon River and head up the mountain passing Adirondack Extreme Adventure park on your left. Almost right out of the gate the road seems to call to me to accelerate hard, but about half way up on the right is a favorite hiding spot for NYSP! At the top of the mountain on your right is Valley Woods Road. If you have the time and you turn onto this road immediately on your right is a pull off for the trailhead to Thomas Mountain. It’s a short easy hike to a cabin with a nice view of the southern part of lake George. 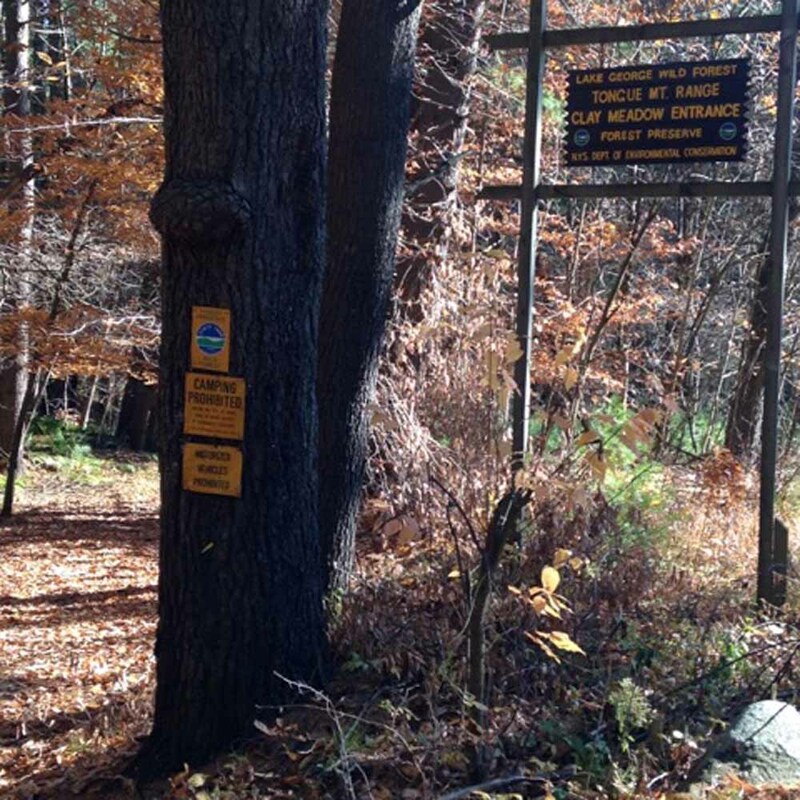 It’s owned by the Lake George Land Conservancy and is open to the public. Continue on and down the mountain to one of my favorite road views. Dead ahead, Lake George and the eastern shore come into view directly over my steering wheel with no need to do anything but look straight ahead. The vista is always beautiful and it changes with the seasons so it’s never boring. In a quarter mile or so you come to Rte. 9 N at a T intersection. Turn left onto 9 N towards the Hague, a drive of about twenty miles. At first the area is fairly populated with camps and homes, but in a short time the road becomes smooth and twisty and the main focus of the drive. The road through the forest parallels the Tongue mountain range. 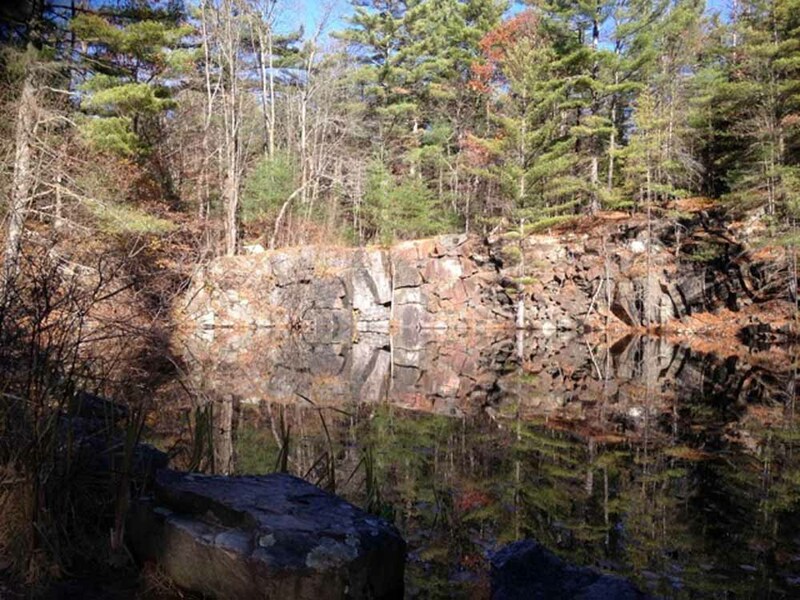 Just after the DEC sign for the Clay Meadow Entrance to the Tongue Mountain Range is a gem of a little pond that looks like it may have been a stone quarry. I like to stop and reflect on it. Also, it’s a spot that I use to let slower traffic go on ahead as passing zones are scarce on the drive; though, there are one or two just up the road in this stretch. The road continues flat and parallels a pretty brook through a reforested pine forest. In a mile and a half or so the road starts up the mountain and becomes steep and twisty but smooth all the way to the top. The pavement on the top is a bit rough- but only for a short way. 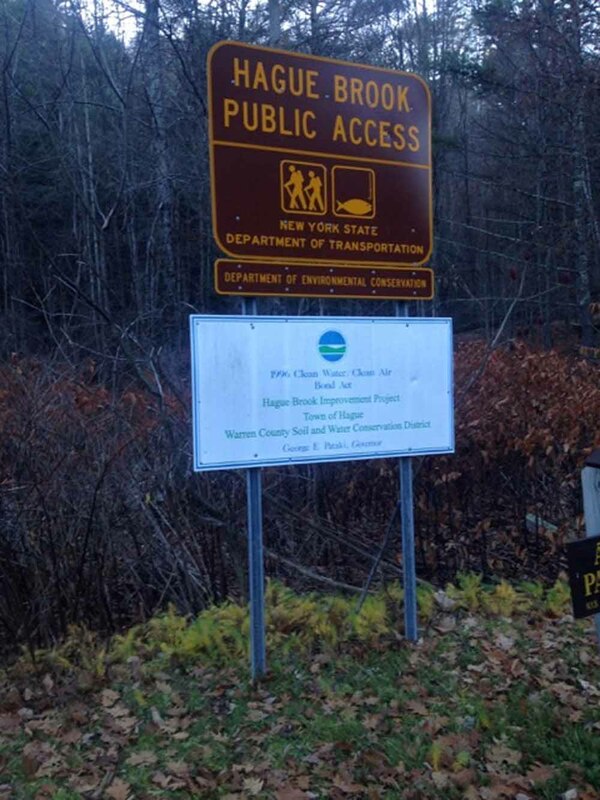 It improves approaching the trailhead for Deer Leap; there’s a DEC sign on the right. The trail is 1.6 miles to a nice overlook of Huletts Landing, Sugar Loaf and Black Mountain on the Eastern shore. Check the trail register for info on the Timber Rattlesnake that calls this area home. 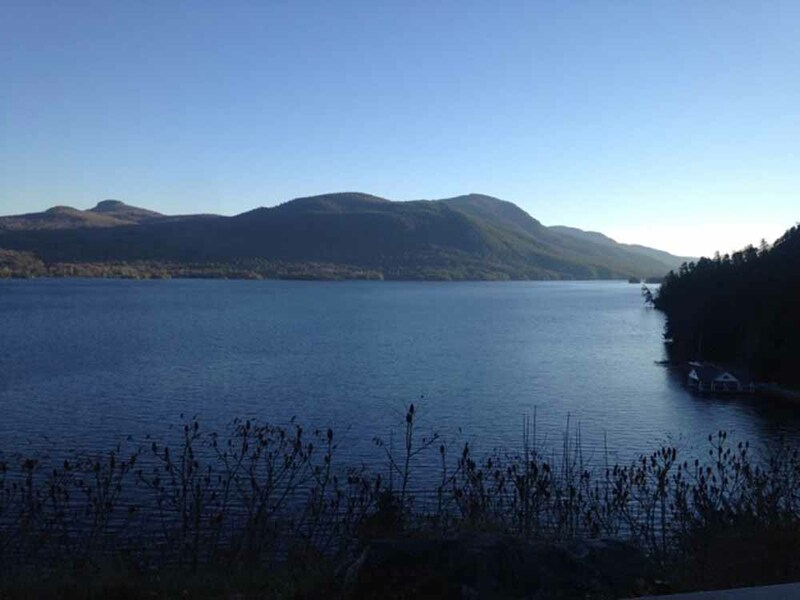 Back on the highway, there is a fun stretch with smooth pavement and long sweeping turns to the bottom of the mountain and a pull off with a close, unobstructed view of the lake, Sugar Loaf and Black Mountain on the eastern shore. There’s not much need to concern oneself about Rattlesnakes here. From the pull-off to Hague it’s a mix of open road and camps with some glimpses of the lake for the passenger to enjoy. As soon as you come into the center of town, take a left onto Rte. 8 toward Brant Lake- about twenty miles away. Heading west out of Hague, on your left is the pull off for Hague Brook. Here a short trail crosses the brook. A hundred yards or so up stream is a nice view of a pretty waterfalls and flume. 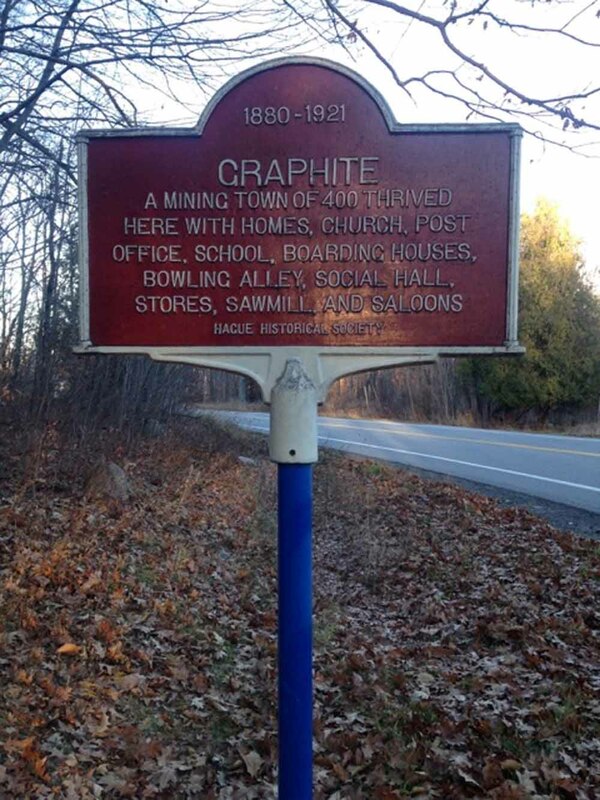 Continue up the mountain through the town of Graphite which consists of about a half dozen houses. 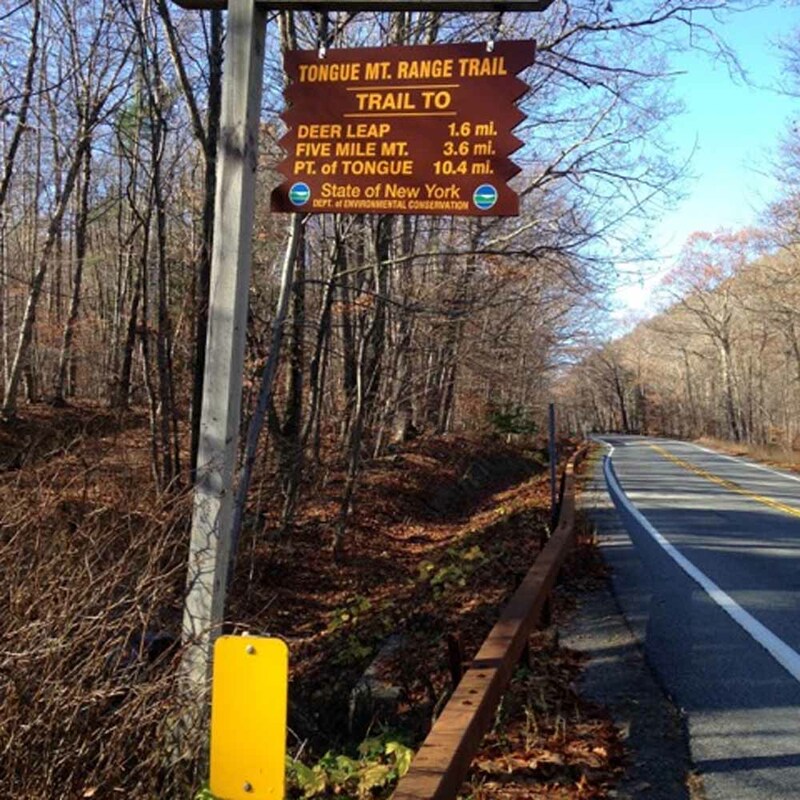 The Graphite Mountain Road [Rte.8] is smooth and twisty to the top of the mountain with Long Pond on your left. The road heads downhill towards Brandt Lake with long straight stretches three lanes wide. The road is enjoyable all the way to exit 25 of the Northway. Even though the speed limits are low in the Brant Lake area, the turns are sharp and the lake is pretty. Returning to exit 24 on the Northway, driving time for the trip is about an hour and fifteen minutes. One of the things that is a plus for me with this drive is it’s being a loop. You don’t have to retrace your path and once on the Northway you are on your way home with smooth sailing on an interstate highway. This entry was posted in Great Drives and tagged featured. Bookmark the permalink.